“Thank you for considering the Atlanta Vision Institute. Many eye care centers in the Atlanta area perform LASIK. However, I’m certain you will not find a center that offers the same level of excellent medical care at such an outstanding value.” – Dr. Ashraf. We’re proud to introduce you to our ophthalmologist and practice leader, M. Farooq Ashraf, MD, FACS. 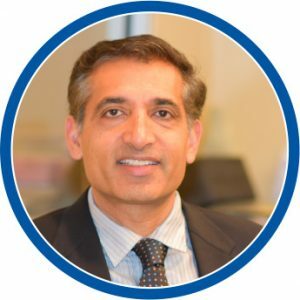 As a leader in the field, Dr. Ashraf has personally performed over 40,000 LASIK procedures and thousands of cataract surgeries. His extensive experience, unsurpassed skills and unwavering devotion to improving the lives of patients come together to provide you with exceptional eye care. Dr. Ashraf has been described as dedicated, efficient, skilled and precise. He has published numerous articles in scientific journals and major textbooks. His extensive credentials and accomplishments demonstrate his commitment to both his work and his patients. Dr. Farzana Virani was born and raised in Houston, TX. She attended the University of Houston to obtain her BS in Biology and then went on to The New England College of Optometry where she obtained her doctorate in Optometry. She trained in her last year as an extern at VA hospitals, Army bases, and tertiary care centers where she was involved in the treatment of complicated ocular diseases like late stage glaucoma, low vision in macular degeneration, and amblyopia or “lazy eye” in children. She has had a passion for eye care and health care from a very young age. As eldest in the family and a natural caretaker, she spent many years caring for loved ones who suffered from various health conditions and ocular diseases including retinal detachments, cataracts, and macular holes. She approaches health care holistically and her treatment plans are tailored for each individual’s needs. Her recent commitment to Ocular Surface Disease and Dry Eye has allowed her to improve the comfort and quality of her patients from day to day lives. She has lived in Sandy Springs, GA since 2004 and has devoted herself to her patients and has developed quite the following of loyal happy patients. In her spare time, she has acted, has produced independent films, and has been part of a stand-up comedy improv troupe, and loves to travel and eat. Recently, Dr. Virani participated in Dancing Stars of Atlanta and raised over $46,000 for the Alzheimer’s Association. Dr. Rondowsky was born in a suburb of Philadelphia in the mid-1950s. He ventured to the South to attend LaGrange College in LaGrange, Georgia, where he completed his undergraduate studies with a BA degree in Chemistry in 1975. From Georgia, he moved to Memphis, Tennessee and attended the Southern College of Optometry. After graduating in 1981, he returned to Atlanta, Georgia where he has been in private practice for the last 26 years. He practices general optometry with an emphasis on contact lenses. 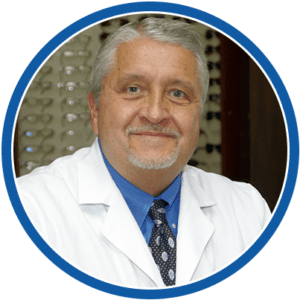 Dr. Rondowsky is an active member of the American Optometric Association, the Georgia Optometric Association, and the Greater Atlanta Optometric Association. During the 1996 Olympic Games in Atlanta, he served as an envoy for the Ukrainian National Olympic Committee. He is also a member of the Ukrainian Association of Georgia. Have a Question or Hesitation About LASIK? Ready to finally SEE CLEARLY? Take our vision quiz to find out if you qualify for LASIK!